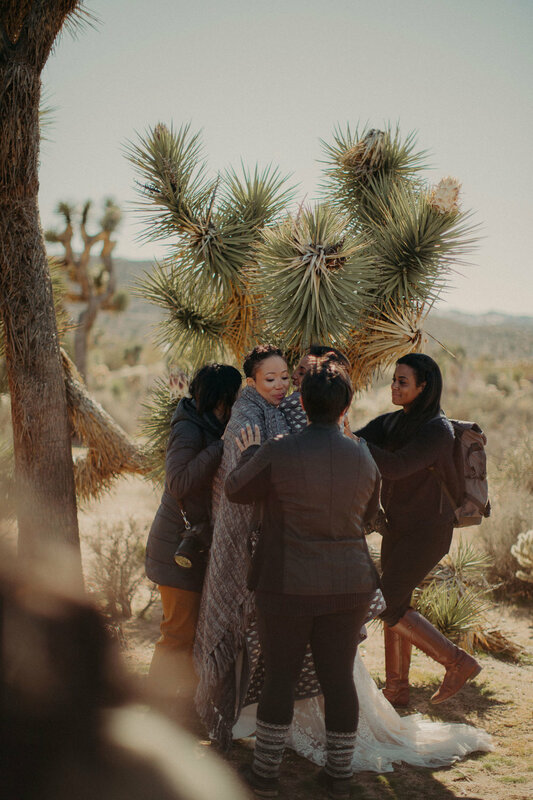 Magical Desert Wedding Elopement Inspiration in Joshua Tree: Mia + Sasja — Catalyst Wedding Co.
Catalyst co-founder Carly Romeo started the Feminist Photo VayCay a few years ago, a retreat where photographers can participate in styled shoots using local vendors and gorgeous couples who are PoC, and/or queer/non-binary. It’s thoughtfully done and a really great time for everyone. 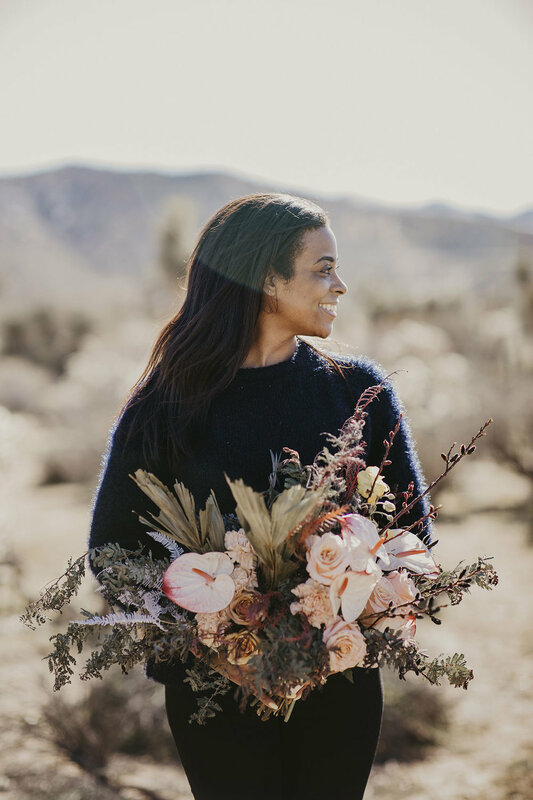 This the first of two styled shoots from the retreat: an elopement inspiration in the high desert at the Tumbleweed Sanctuary. Mia and Sasja are our real-life couple and models, and they were incredibly brave in what was shockingly cold weather. 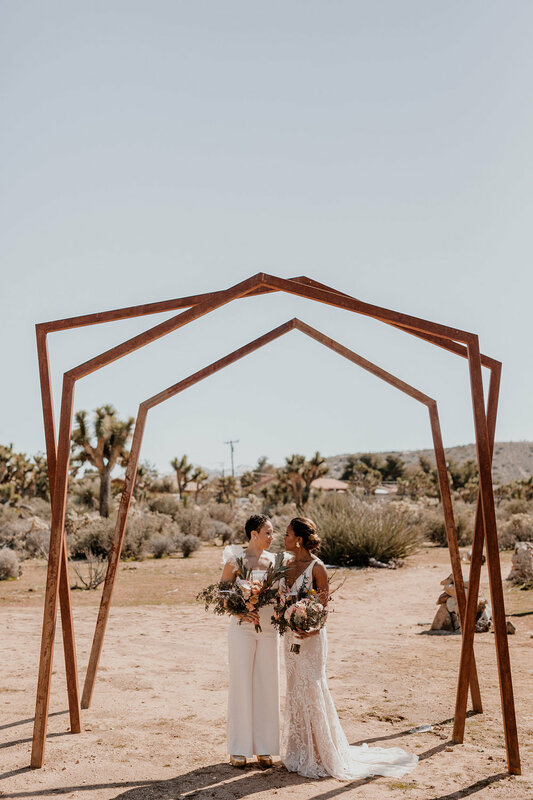 I knew right away that I wanted to do the wedding shoot in the desert and had a vision of doing something modern and subtlety woo woo. 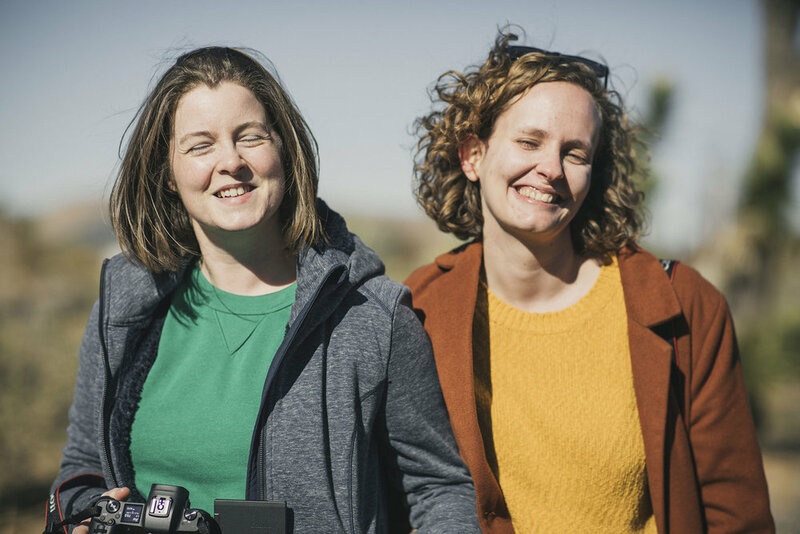 As I began to search for our dream team of desert area vendors, I stumbled upon Tumbleweed Sanctuary’s instagram. The venue was perfect for my vision. 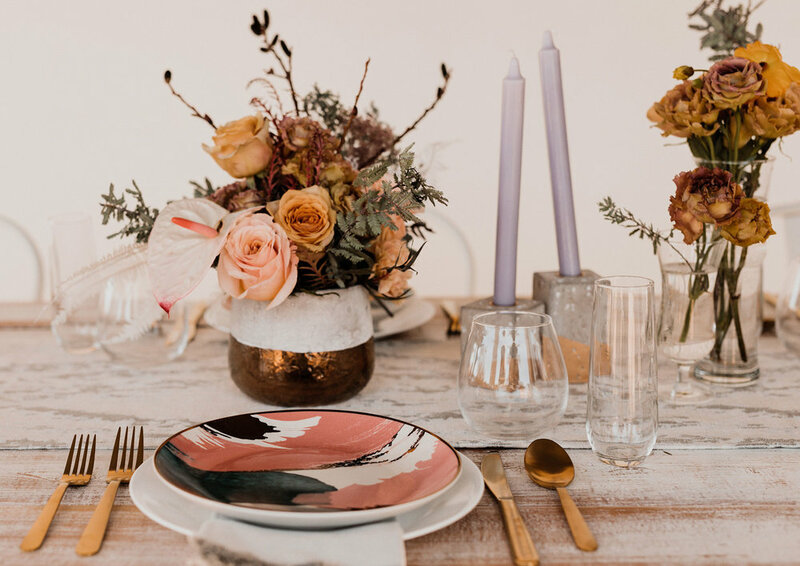 It’s located in the high desert area of Yucca Valley, and boasts a gorgeous stone labyrinth, huge inventory of beautiful vintage furniture, and acres of breathtaking desert landscape. 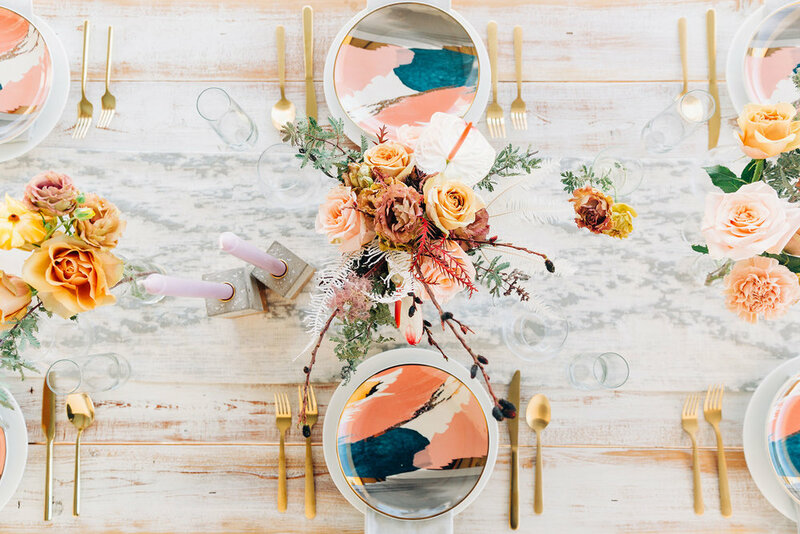 A few years ago, I designed my sister’s bachelorette party in Palm Springs, and we had the pleasure of working with Studio Kate Floral for our table scape. 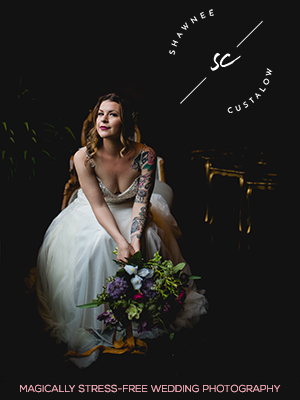 Kate is a firecracker of energy and creativity, and she had blown our minds with what she had done for that party. 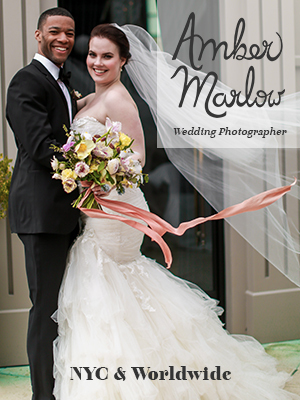 I was elated when she told me she was up for doing florals for this project, too. 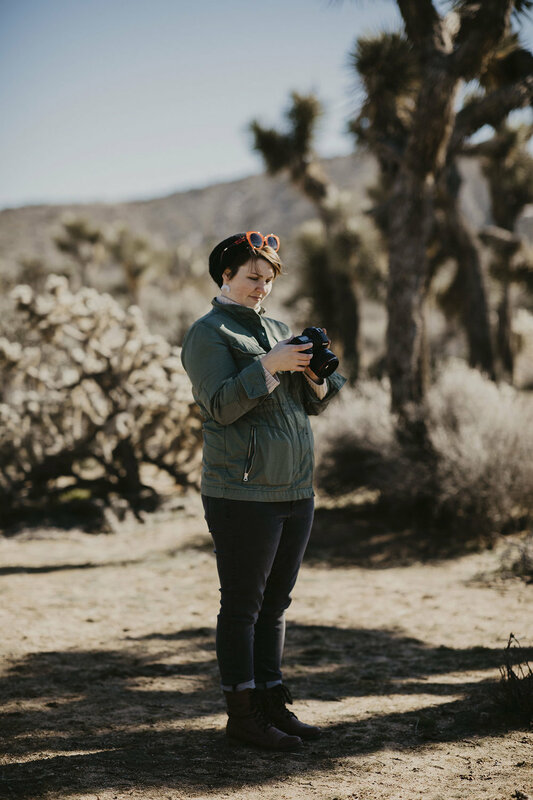 I gave her a few of my ideas and inspiration pics, and what she brought was the perfect interpretation of the wild textured beauty of the desert. With all FPV shoots, we only use real life couples as our models. The resulting photos are a million times more genuine when working with a couple who is actually in love and excited to celebrate those feelings. I posted an open call for couples and received so many awesome applications. The winning couple ultimately had been referred to us by Yazmin, who had starred in the very first Feminist Photo Vaycay shoot two years previously. Mia and Sasja were not only madly in love, but they also own a pole dancing workshop and studio, educating their students how to embrace confidence and a healthier lifestyle while having fun doing it. We really admired their work and dedication to fostering a community that promotes exercise, mindfulness and confidence. 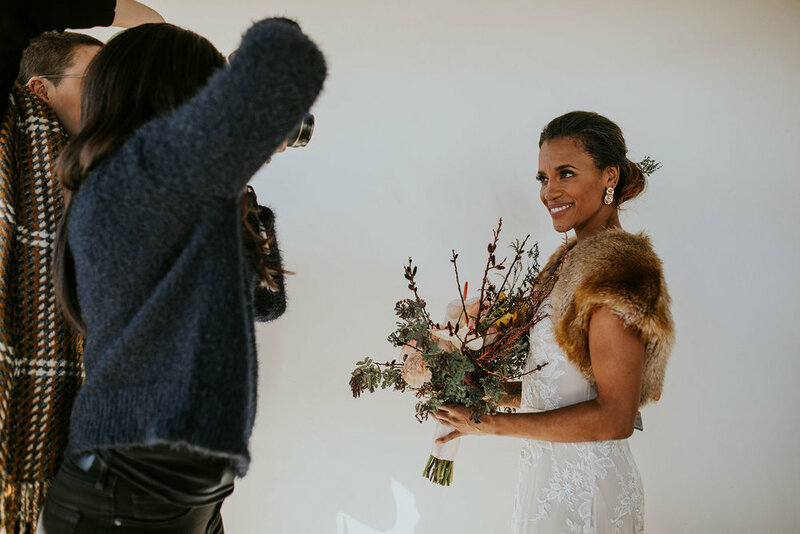 Floravere provided us with the dreamiest of gowns and pantsuits for our models. 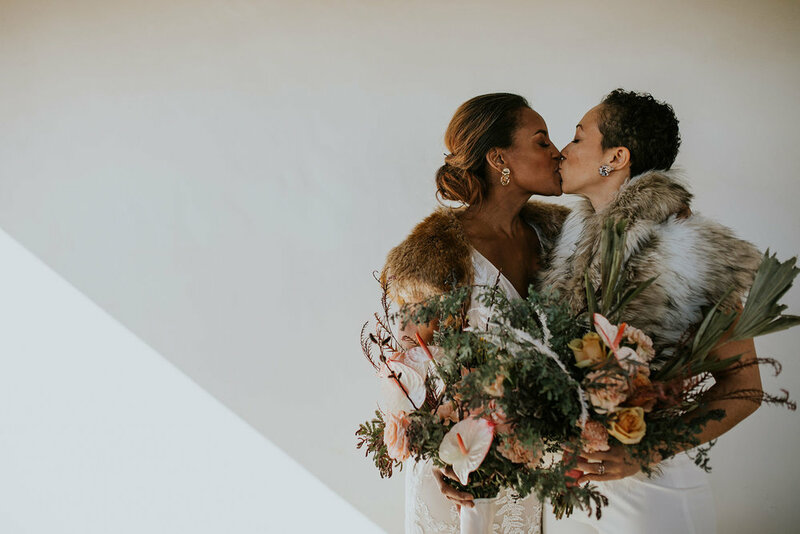 Their company motto is ‘Wedding Dresses for Wedding Rule Breakers’… check and check! Our jeweler was another instagram discovery. Giacomelli’s jewelry designs are bold and unique, with a beautiful mystique. A few weeks prior to starting work on the shoot, I had met the ladies of Ephemora at a vendor event in Brooklyn. 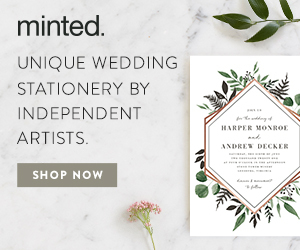 They owners of the company are sweet, funny and it was kismet that they were just launching their line of modern wedding stationery. I chose their “Marbles” design from their collection, know that the yellow and purple hues would pop against the muted desert scenery. Our hair and makeup artist was Christina Glams. She was so easy to work with, and I really loved the direction she took with their hair and makeup for this shoot. The resulting look was soft yet bold. On the day of the shoot, we had the VERY unexpected surprise of extraordinarily rare cold snap. 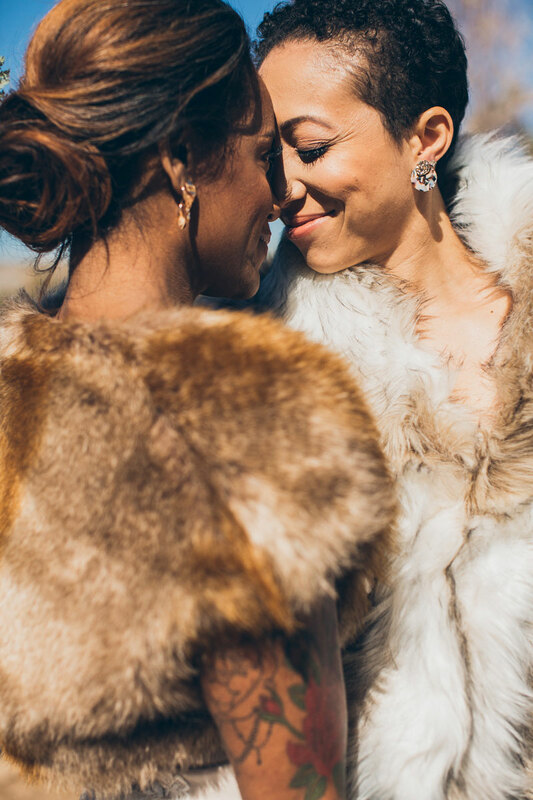 I overnighted some faux fur boleros so that our brave models wouldn’t be completely frozen for the outdoor shots. It helped some, but I really have to applaud Mia and Sasja were being complete badasses throughout the whole shoot. Their attitudes remained so positive even as we thawed out their feet and hands with space heaters and blankets in between shots! Endless thanks to all our vendors, models, and photographers who contributed to they success of this shoot! It was truly a team effort and the perfect epitome of what I always appreciate most about Feminist Photo Vaycay which is community and creativity.